Oh, you weren't watching all 140 days of the Texas legislative session? We've got you covered — with the best floor fights, the most dramatic moments, the most emotional speeches and, of course, a bill about "masturbatory emissions." 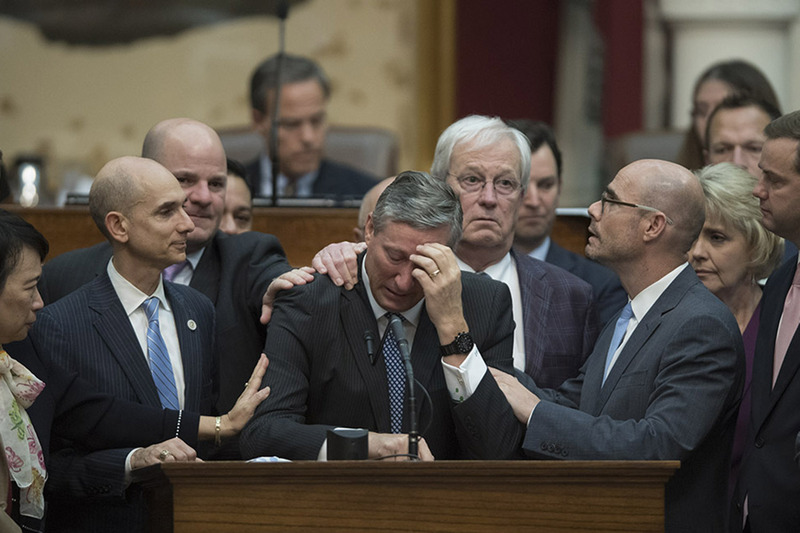 Tears, jeers, shouts and pouts filled the Texas Capitol this legislative session. Bills died, others survived and some still remain uncertain. 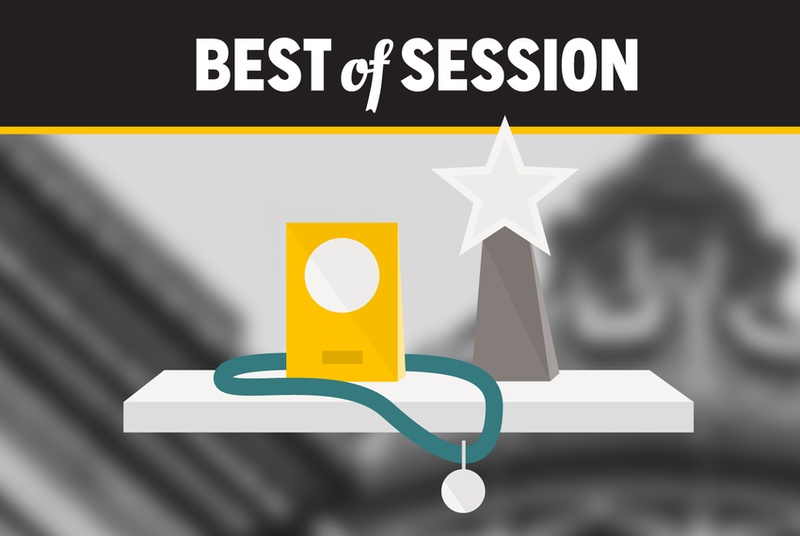 Here’s a rundown of the bests and worsts, the highs and lows from the 85th Texas Legislature. There were two skirmishes in the House this session that nearly came to blows. The first came when House members debated their version of the 2018-19 budget. As tensions bubbled, two conservative lawmakers confronted each other and had to be physically separated. Rep. Jonathan Stickland, R-Bedford, had filed an amendment to defund a state program for the abatement of feral hogs, which he’s become known for championing each session. He railed against the program, calling it “ridiculous” and a waste of money. That offended rural lawmakers, notably Rep. Drew Springer, R-Muenster, who attached an amendment to Stickland's proposal that would've cut the same amount of funding for roads and highways in Stickland’s hometown. Stickland took to the back microphone to cry foul. “Someone else has chosen to make a mockery of this system and play gotcha politics,” he said before being interrupted. Laughter had erupted in the gallery. “It’s funny until it happens to you,” he added. Springer and Stickland then confronted each other in the middle of the House floor and had to be separated by colleagues. After Springer’s amendment to Stickland’s proposal passed 99-26, Stickland withdrew his own. The second fight was far worse — and it happened on the normally diplomatic and ceremonial final day of the session. But it echoed the biggest and most personal debate of the session: consideration of "show me your papers" legislation that banned "sanctuary cities" in Texas. Hundreds of loud "sanctuary cities" ban protestors filled the House gallery, disrupting proceedings for a full 20 minutes. That's when an angry state Rep. Matt Rinaldi, R-Irving, called immigration enforcement officials on them — enraging his Hispanic Democratic colleagues, and allegedly prompting Rinaldi and state Rep. Poncho Nevárez, D-Eagle Pass, to threaten each other. Video from the House floor shows lawmakers from both parties pushing each other. In a news conference following the altercation, state Rep. Justin Rodriguez, D-San Antonio, said Rinaldi had also threatened to “put a bullet in one of my colleagues’ heads.” According to other Democratic lawmakers, including state Reps. César Blanco, D-El Paso, Armando Walle, D-Houston, and Ramon Romero, D-Fort Worth, Rinaldi approached their group and said, "'I'm glad I just called ICE to have all these people deported.'" Rinaldi said in a statement after the encounter that Nevarez "threatened my life on the House floor" and that his comments were made in self defense. He also said he was under the protection of the Department of Public Safety. In a tweet, Nevarez called Rinaldi "a liar and hateful man." 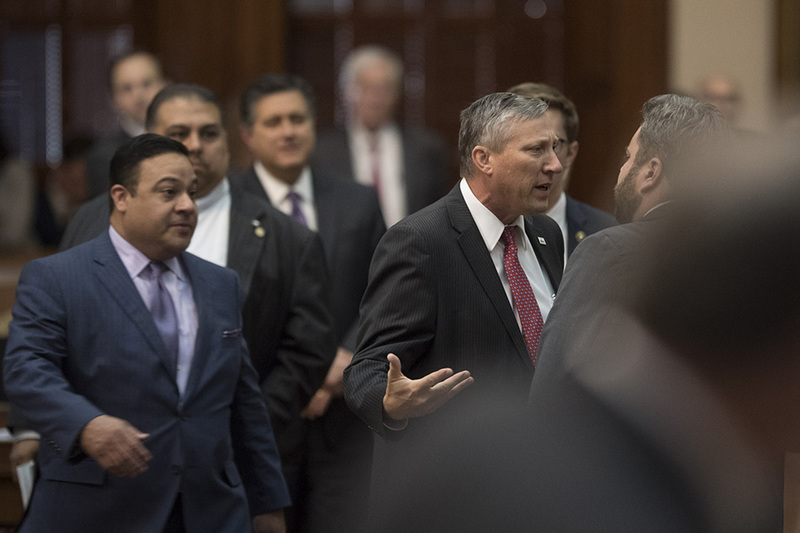 On May 23, state Rep. Harold Dutton, D-Houston, approached the back mic and said he was upset with the Senate’s inaction on several bills authored by House members. Dutton, riling up colleagues, shouted, "When the Senate won’t respect us, they need to expect us!” The chamber doors opened moments later — an effort for members' calls to be heard across the Capitol rotunda in the Senate. Dutton pressed the same button the next day. Standing at the back mic once again, he said he intended to run out the legislative clock on roughly 150 Senate bills placed on that day’s agenda for uncontested legislation. After a few minutes of discussion, several House members exited the chamber and headed to the Senate for a closed-door meeting with Lt. Gov. Dan Patrick and other senators. Dutton called the meeting “productive.” And by all appearances, a deal had been made: House members flew through Senate bills shortly afterward. Despite having her bill shot down three times by members of the House's ultra-conservative Freedom Caucus, state Rep. Helen Giddings, D-DeSoto, continued to push to eliminate “lunch shaming” in Texas schools. During a personal privilege speech on the House floor, Giddings held up a sample of a piece of cheese given to students who lack money to pay for school lunches in Dallas area schools. “These children deserve better than what we’ve done to them,” she said. Under her proposal, which eventually was tacked onto another passing bill, local school boards would have to develop a grace period policy that ensures students without enough money in their school lunch accounts have some time to resolve the issue. There were several, and most of them revolved around a single piece of legislation: Senate Bill 4, the state's "sanctuary cities" ban. The Sunday before an anticipated Wednesday floor debate in the House on SB 4, freshman Rep. Victoria Neave, D-Dallas, announced she was going on a hunger strike over the bill. “I want people to know how terrible this is,” she said. State Rep. Mary González, D-Clint, asked lawmakers to vote down a "show me your papers" amendment to the bill that would let local law enforcement question the immigration status of people they legally detain. “If you ever had any friendship with me, this is the vote that measures that friendship," González pleaded. The amendment passed into law. As the lower chamber nearly self-destructed over the House Freedom Caucus' intent to kill more than 100 local and uncontested bills — payback, they said, for a failure to address key anti-abortion bills they wanted — Springer broke down in tears. He begged colleagues to hear a bill on the calendar that would allow partial experimental cell treatment, referencing his wife, who has used a wheelchair for years after an accident. The House approved the bill shortly afterward, and on May 24, the Senate voted out the bill. After the House Freedom Caucus delayed consideration of several bills, including a must-pass measure to keep some state agencies alive, the Senate seemingly had the upper hand. Its version of that bill was still in play. This led Patrick to give the lower chamber a public ultimatum: The Senate would only pass its version of the agency "sunset" bill if the House took action on the "bathroom bill" — restricting bathroom use for transgender Texans — and a property tax measure. If the House didn’t, Patrick said, he would ask Abbott to call a special session. Patrick’s threat came a day after House Speaker Joe Straus sent the lieutenant governor a letter noting that the Legislature could avoid a special session if it finished its work on the budget and passed the "sunset" bill. The House later approved property tax legislation but excluded provisions the Senate wanted, making it untenable in that chamber. It also tacked an amendment onto another bill that would've allowed transgender students to use single-stall restrooms, locker rooms and changing facilities at public schools. Patrick wanted more. He rejected the House’s proposals on both bills, and the two chambers never reached a compromise. Several members from both chambers expressed interest in moving up or out after this legislative session, so there’s no clear winner in this category. For starters, who’s going to run to replace U.S. Rep. Sam Johnson, R-Plano, who announced he was retiring from Congress in January? Van Taylor, a Republican state senator from Plano, is one contender, and he’s expected to announce his bid for the seat sometime in the coming months. But who will vie to replace him in the Senate? State Rep. Matt Shaheen, R-Plano, is one possibility. Rep. Jeff Leach, another Plano Republican, announced in a post to constituents on Facebook that he planned to run for re-election to the House in 2018. Meanwhile, Stickland suggested he might consider statewide office after U.S. Sen. John Cornyn was reported to be on the short-list to lead the FBI. Cornyn quickly pulled his name out of contention for that job. One legislator tried to shake up the health care debate with a bill that would fine men $100 for masturbating and let doctors invoke their "personal, moralistic or religious beliefs" in refusing to perform an elective vasectomy or prescribe Viagra. Farrar filed her bill in March. It was referred to the House State Affairs Committee in April but never received a public hearing. She previously told The Texas Tribune that she knew her “satirical” measure wouldn’t go far in the legislative process, but hoped it would foster a deeper understanding about women’s health care.